A couple days ago, I received the following email and the attached photos from my friend Joella Bates DeWitt, one of the most acomplished hunters I know. I had the pleasure of spending several days bowhunting and quail hunting with Joella at a writers camp a couple years ago when I took this buck. While we were in camp, she shared her amazing photo album of hunting adventures and her video footage of becoming the first woman to take a cape buffalo with a bow. It was pretty darn impressive. Joella is a great ambassador for bowhunting and is very active in recruiting other women to the sport. Congratulations Joella and thanks for sharing your story and photos. 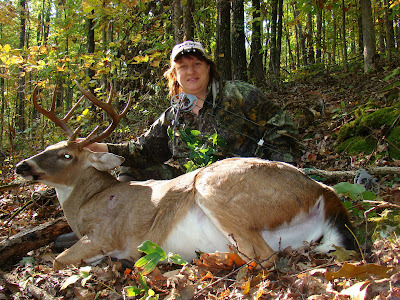 On Nov. 8, 2009, I took my second amazing buck of 2009 (Editor's note: see the photo of her first buck below). This time I spotted him bringing up the rear in a rut chase. A 1 ½ year old 5 pointer was hot on the tail of a doe that must have outweighed him by at least 50 pounds. The pair advanced to the terrace that circled the just-cut corn field that our stands overlooked. Dan began filming the chase. I continued to watch also until the flash of big white antlers caught my attention. He was coming. Hot on the trail of the pair, he followed the same route to the terrace. Being the mature buck that he was, he stopped to paw a couple of hits on his scrape before coming within bow range. On the previous Monday, I had rattled in a 190’s buck that came in so fast and so close that I could not get turned or draw on him. Not to repeat the missed opportunity, I drew when he was 60 yards out and headed my way and held. We had several challenges that we had to overcome in order for me to take the shot. He had to come in range. The doe and little buck had gone into the woodlot just to our east. When my husband, Dan DeWitt, bleated, the buck stopped to look for the doe. The gusting winds exceeded 30 miles per hour making the 20 degree F wind chill brutal. My Raven Wear kept me warm and as comfortable as you can be in those conditions, so I had no trouble drawing the 75 pound BowTech Guardian. The problem came with trying to remain balanced on the small Gorilla lock-on platform 22 feet high in a leaning pin oak. The buck came in behind the tree forcing me to attempt to get a shot through the thick branches. The platform was too small for me to comfortably balance on with the rock’in and roll’in occurring as a result of the wind gusts. Thank goodness for the safety harness that my neighbor, Robert Frady, had made for me with a six-foot barge-rope attachment to the tree allowing me the maneuverability to get turned to safely attempt the shot. The hold-up was there were two tree limbs that touched my bow when I tried to aim. I didn’t dare shoot until I could shoot without hitting a limb. Finally, Dan bleated the buck to a clear spot, just 15 yards from the stand. While he stood directly downwind, I released the power of the Aerodynamic Solutions ATOM broadhead. I watched the arrow impact and stop. Knowing that the shot had hit both lungs and suspecting I had taken his heart, I watched the buck explode for 20 yards, then slow after another 40 yards. After a brief moon-walk and break-dance, the buck tumbled into a grassy grave. I stayed in the tree, but switched places with my husband. He became the hunter and I the camera-girl. Finally, he told me that I could climb down and go see my buck. I started climbing down, but got interrupted when I spotted a buck on the field. I hung on to the ladder and filmed until we ran out of light. The buck came within 12 yards of us in the woodlot, but he was not sporting appropriate headgear to become a movie star. I will tell you the rest of the story later.